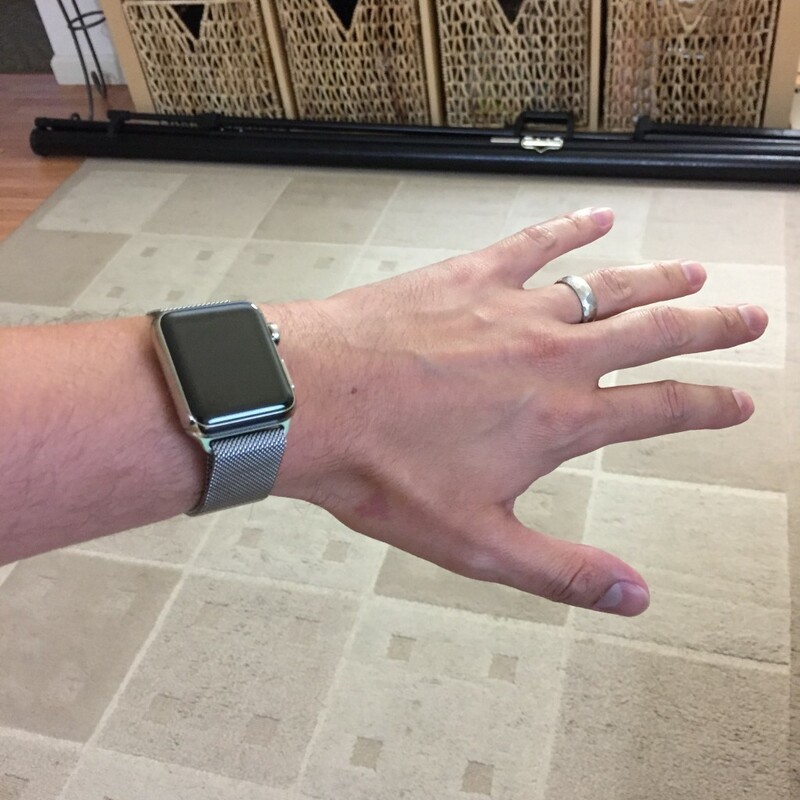 The Apple Watch on my wrist. Yes, I bought the watch. As an HCI researcher, I couldn’t resist knowing: what’s this thing good for? As someone who often has a day full of meetings at random times and places, the killer app for me is being able to glance at my wrist to see where I’m supposed to be —without awkwardly pulling my phone out in the middle of a meeting. It’s hard to overstate how valuable this is to me. It turns the social meaning of pulling out my phone to check my calendar from “I’m checking email/browsing the internet/texting a friend/and generally disinterested in this conversation” into a brief glance that means “I think have somewhere to be, but I’m listening”. When I’m driving, I frequently have thoughts that I’ll lose if I don’t write them down. This creates a critical dilemma: do I grab my phone and try to have Siri transcribe it, but risk my life and a traffic ticket, or risk losing the thought? With the watch, I can dictate thoughts hands free with a quick flick of my wrist and a “Hey Siri, remind me to…”. This is particularly handy for OmniFocus, where I externalize all of my prospective memory. Text messages are much less disruptive socially. No more loud phone vibrations or accidental sounds to disrupt my coworkers. Instead, the watch tells my wrist and I glance down briefly. This is the best UX for Uber. “Hey Siri, open Uber”, tap the request button, and wait 5 minutes. Yes, you can do it on a phone, where you can get far more information, but I’m usually using Uber in unfamiliar places where I don’t necessarily know how safe it is to pull out a big bright iPhone and tap on the screen for a minute. This makes me feel safer. This one is completely idiosyncratic to me, but I absolutely love the Alaska Airlines glance view, which simply shows a countdown until the number of days until my next flight. I hate flying, and somehow, being able to quickly see how many more days of freedom I have before I climb into a tiny box and suffer sinus pain, dry air, and cranky people, gives me a sense of freedom and appreciation for being a land mammal. So far, everything else is of little value. I don’t like reading Twitter on the device and certainly don’t want to feel every tweet on my wrist. I’m active enough and haven’t ever wanted any device to support exercise. I get way too much email to want to triage on the device for very long. Most of the third party apps aren’t that useful yet (although as companies learn what information and services are most valuable to their users, I believe they’ll improve in their utility). As a 1.0 device, it has all of the problems you might expect. It’s slow at times, while it talks to my iPhone. The navigation is model clunky and inconsistent. Sometimes Siri hears me say her name, sometimes she doesn’t. These will probably all be ironed out in a version or two, just as with most devices. These issues aside, if you look at the list of benefits to me above, they fall into some unexpected categories. I thought the value to me would mostly be getting information faster, but most of the value is actually in reducing friction in social interactions and a sense of safety in various situations. This is not a device to get digital stuff done. It’s a device to get digital stuff out of the way. After 4 hours of continuous use, I can confidently say that the iPad rocks in many ways, and fails in only a few. It’s a genius way to browse the web, to write short emails, to listen to music, to watch short videos, to use Facebook and Twitter, to give simple presentations, to read news, and to show photos. Theres literally no better experience out there for most of these activities. It’s also a great sketchpad — not as great as a real sketchpad, mind you, but oh so much easier to share and archive. It fails in the obvious places. The onscreen keyboard is bearable. I can tye a lot faster than on my iPhone or any cell phone, but I’m not getting my typical 80 wpm. A wireless keyboard would make up for a lot of these limitations, but it sort of defeats the purpose of carrying something slim and lightweight. I’ve typed a lot on is in the past few hours and I feel a bit held back, but not so much that I don’t feel productive. There are still some ways where multitouch is inherently limited. One out of every 10 times I tap or drag, it doesn’t do what I want. This is no different than on the iPhone, but I’ve noticed myself acclimate to the inaccuracy. The device hasn’t gotten any smarter, I’ve just gotten more tolerant. The iPhone UI toolkit still breaks many pervasive web conventions. For example, I’m typing this in a text field in a WordPress page, and scrolling up to edit the previous paragraphs is incredibly slow, even with the two fingered scroll interaction, compared to a scroll wheel. Yeah, I’m a little late to the discussion. But as I’ve contemplated over past weeks the merits of the iPads form and function, trying to imagine what I’d do with it and what others might do with it, I keep coming back to the same problem: the iPad, nor the iPod or iPhone, support juxtaposition. That’s what all of this whining about multitasking is about. So many things we do on computers is compare, contrast, and cross-reference between applications, and yet that’s one of the major things the iPad cannot do. I wish copy and paste were enough, but it’s not. It’s about writing an email about the news article you have open, or quickly checking the status on some build, or reading a dictionary definition online while you’re writing. You can’t do these things on single-task UIs, because the cost of leaving one app, opening another, and then returning to an app is at least 30 seconds. That, and everything you might want to juxtapose against has to be kept in your head for these 30 seconds. Good luck with that when you’re trying to think. So maybe Apple decided the device wasn’t for thinking or creating. Maybe it’s just for consuming. But even consumption takes juxtaposition. I find myself on my iPhone all the time, wanting to read a Yelp review and see where a place is on the map at the same time. Because this isn’t possible, the Yelp app tries to do maps well, and the Maps app will probably try to incorporate reviews, leading to substandard experiences in both apps. Or, another example was when I was doing my taxes online: I was referencing advice in forums about teacher deductions (which I found out I can’t take), while trying to decide how to answer a TurboTax question. On the iPad, I’d have to go back and forth between the two, memorizing all the numbers and exceptions in the forum post in order to act upon them in the tax software. People are going to realize this soon, too, and Apple’s going to suffer for it. Either Apple is just waiting for the right time to support juxtaposition, or their designers just have no idea how people produce and consume information. I just spent a day at Edward Tufte’s course on information design at the Seattle Marriott Waterfront. I’ve always known his work, I’ve talked about it in design classes, I’ve told students to read his books, but not once have I heard him speak. Now I can confidently say that his captions speak louder than words. Snicker. That’s not to say he wasn’t insightful. The books have always been a nice translation of classic design principles into static visual information design, but most of the course was simply him parroting his own words. What made it unbearable was that he spoke them with the lifeless apathy of a statistics professor. Oh wait, he was one. Aside from his lack of spark, there were a number of nice things about the day. I got a box full of his books; I got a refresher on visual information design; I had a chance to think more about forms of dissemination for my research (I tire of limiting my influence to academic publications). It was also a nice calm before my early May storm of deadlines.